No Swedish Christmas is complete without Knäck! Together with ischoklad (ice chocolate) it is the most typical Christmas candy in Sweden. I don’t know the correct translation for it, but I guess Swedish Christmas Toffee or Swedish Christmas caramel. Mix cream, sugar and syrup into a pot and bring it to a boil. Boil on medium heat for 30 min (stir once in a while). There should be a lot of bubbles. Please note that the time could change depending on the size of the pot and the heat of your stove. Then start measuring the temperature of the mixture. It is ready when temperature is around 125-130°C (257-266°F). For me it took around 45 min. While waiting for the mixture to be ready you can prepare a tray that you pack tiny paper cups tightly on. Also chop the almonds so it is ready and find a suitable metal container to pour from. Take the mixture off the heat and stir in vanilla sugar, butter and almonds. Carefully pour the mixture into the small paper cups trying to avoid them from flipping over, or getting yourself burnt. Use a thermometer so you can stop the cooking at 125-130°C (257-266°F). This ensures the perfect chewy consistency. Note that it might be difficult to remove from the paper cups if they are stored in hot room temperature. Many recipes will say a certain time to boil it, but it is so dependant on the heat and the pot, so it is a rather useless advice. Other recipes frequently mention the “ball test” which means that in order to find out if the mixture is at the right temperature you take a small spoon of the mixture and pour into a glass of cold water. 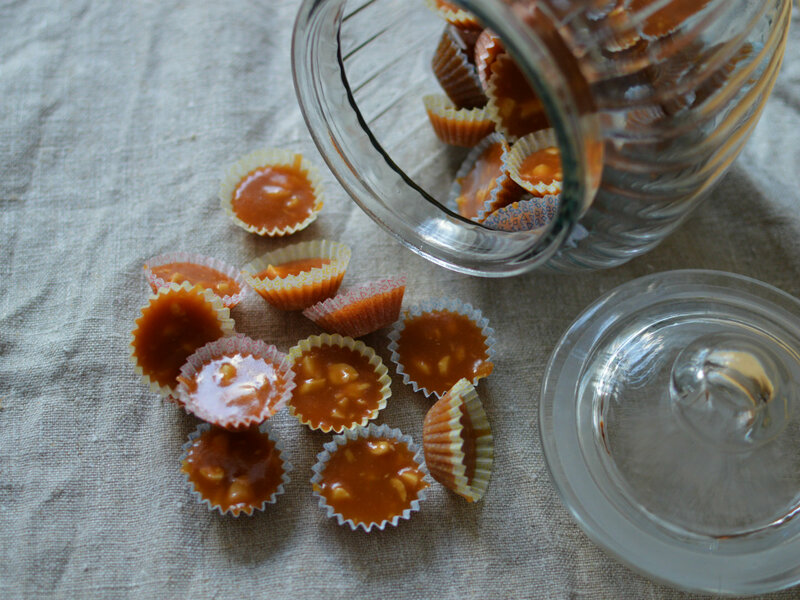 If the caramel turns into a ball that you can touch and mold then it is ready. Even though this works, it is a lot easier to just using a thermometer every time you want to check if it is done! Use a metal container that is easy to pour from, otherwise it is a mess trying to get the right amount of piping hot gooey mixture in to the small paper cups. I found that the best way is to combine with a small spoon to help guide the right amount of mixture down the paper cups. Knäck is to be stored dry and cool in an airtight container. If you store them on top of each other and they are a bit more gooey then it could be a good idea to use parchment paper between so they don’t stick to each other. It will last for around 3 months. If you need to make some quickly then you can try this way to make knäck in the microwave, haven’t tried it myself though..
Just made the orange version and it worked great. I only had to boil it for 15 minutes, I think because the pan was pretty big. I had to rush to get the cups out!